Sometimes you just don't feel inspired but want a piece of jewelry. 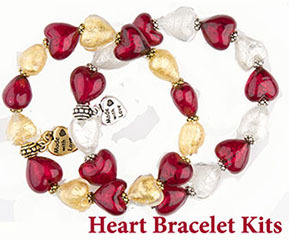 We've added some jewelry kits here which will help you make your very own Venetian Glass Jewelry. Everything is included except tools and we make it really easy, you can even borrow these from the handyman (person) in your house. So to enjoy your Murano Glass Jewelry without the hassle of choosing findings or beads, it's here.